SoftPlanet makes it possible for everyone to get free Anti Autorun-7 download directly from our servers. There is no registration needed for downloading. Anti Autorun-7 1.0 is a very smart application that is designed to set protection on all removable USB devices. It is a freeware program and can be downloaded in no time on any Windows-based PC. What this app does is to create a folder called “autorun.inf” which disables the autorun feature of your Windows OS when you insert a USB device. The program is compatible with all USB, MP3 and smartphone devices and is very simple to use. 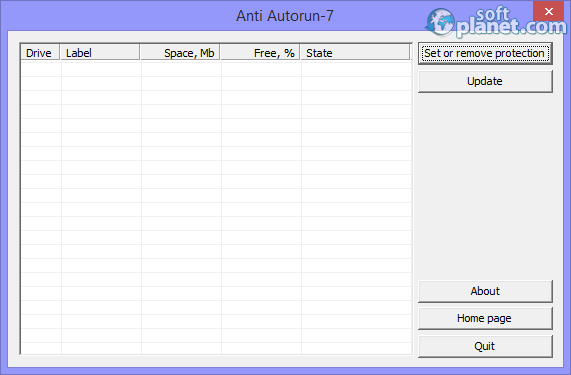 The interface of Anti Autorun-7 is a window which has several columns. They are named based on the removable drive features that are shown. Once you plug in your USB stick it will show up as a line in the program and you can set or remove this protection with a single mouse click. Drive letter, label, total capacity and remaining free space are shown at a glance to you. The last column has a “clear” word if your device is not protected and “protection is set” if you already have set it up. 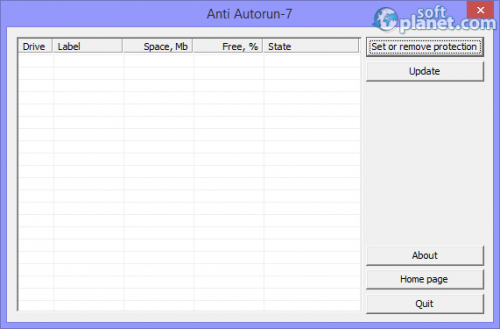 Anti Autorun-7 1.0 is a very good program that can prevent your removable devices from autorunning virus distributions. However, it cannot protect already infected devices as well as computers. So you can use it without hesitation but keep in mind that your primary goal is to keep your PC clean and virus-free. Our security scan shows that Anti Autorun-7 is clean from viruses. The current version of Anti Autorun-7 has been scanned by our system, which contains 46 different anti-virus algorithms. That ensures that Anti Autorun-7 1.0 is 100% safe for your computer.